Imagine this scenario. You visit your local supermarket to pick up your groceries for the week. The total bill is around $100, and when you whip out your trusty American Express card to complete the purchase, you’re told there will be a $3 surcharge. You’re immediately outraged and begin arguing with the clerk. They calmly explain that it’s a new industry-wide charge, and if you don’t want to pay the fee, you can use cash or debit instead. You realize you don’t have the cash on hand or the money in your checking account, so you reluctantly pay the $3 fee and mutter expletives under your breath. While this may sound shocking, retailers could begin directly charging customers who use credit cards as their preferred form of payment. At the moment, Visa and MasterCard don’t allow such “swipe fees,” but thanks to a class-action lawsuit, retailers may get the green light to begin charging those who opt for plastic. However, merchants would only be able to charge the cost of the swipe fee, which ranges from 1.5% to 3% of the purchase amount. The rule change isn’t finalized yet, but if it is, the sweeping change could come as early as 2013. That begs the question; would consumers pay the fee or just use cash or a debit card instead? Well, leave it to CreditCards.com to conduct a survey to answer that pressing question. 65% of Americans Say No Way! Nearly two-thirds of the 1,005 surveyed via telephone said they would stop using their credit cards if charged the fee, no matter how small it was. To them, it’s probably just the principle that a retailer would “penalize” them for using plastic, which is pretty much the standard form of payment these days. Of those who said they use their credit cards “frequently” or “always,” the number was even higher at a staggering 69%. In other words, retailers would have to be very careful not to scare off potential customers by implementing the fee. At the same time, younger consumers didn’t seem to mind the fee as much, with about half (52%) opting for a different payment method. This could have more to do with the fact that younger consumers don’t actually have the cash on hand, as opposed to it being a convenience thing. Either way, it appears that such a change would be met with plenty of resistance. While one could argue that the merchant is charged the fee, so they’re simply passing it onto the consumer, most retailers already factor in the cost. So even if swipe fees are explicitly charged to customers, they’re already present, whether we realize it or not. To that end, we’d effectively be double-charged when using plastic, and unjustly charged a single time when opting for cash. Either way, merchants who currently price in the fee are making out like bandits because of all the customers who use cash and pay credit-based prices. It will certainly be interesting to see who charges the swipe fees. Most pundits see the smaller mom and pop stores charging the fee. Heck, some already do rather illegally. 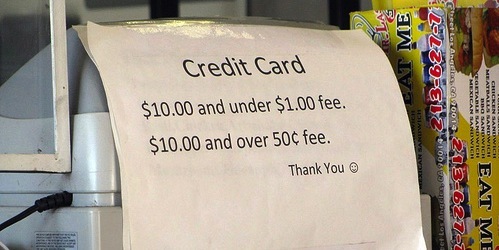 Other merchants may use the rule as a marketing stunt by placing, “no swipe fees” placards all over their storefronts. Who knows? Either way, it’s a scary thought to think we could be charged for using our plastic. And if it actually happens, the credit card issuers are going to have to up their rewards to cover the cost, or credit card use could plummet. I would certainly ditch my credit cards if I had to pay 1-3% of every purchase, on top of the inflated price I already pay. Read more: Will credit cards be obsolete? Previous Previous post: Chase Liquid: Just Another Prepaid Credit Card?